Vroom, vroom. That’s how the song started. Teenage love: good girl, bad boy. He rode a motorcycle, imagine, a motorcycle. Times change, a recurring theme on this blog. Today everyone and their aunt rides a motorcycle. I rode motorcycles when I was younger. I love motorcycles. I was never in a pack though, and certainly not the leader. Vroom, vroom. OK, now it’s 30 years later and I’m in my studio. I remember it was a beautiful spring day and the studio was glowingly bright. A call came for me and I took it just off set. It was a guy from Carmichael-Lynch in Minneapolis. Jim Keane. Now I always had a problem getting work from Minneapolis, they had good photographers there who worked in my area, so I wasn’t very excited. Jim was soft spoken and got right to the point. He wanted to know if I’d be interested in shooting the new Harley-Davidson campaign. Vroom vroom! Naturally I told him I couldn’t think of much I would prefer to do, it sounded very exciting. 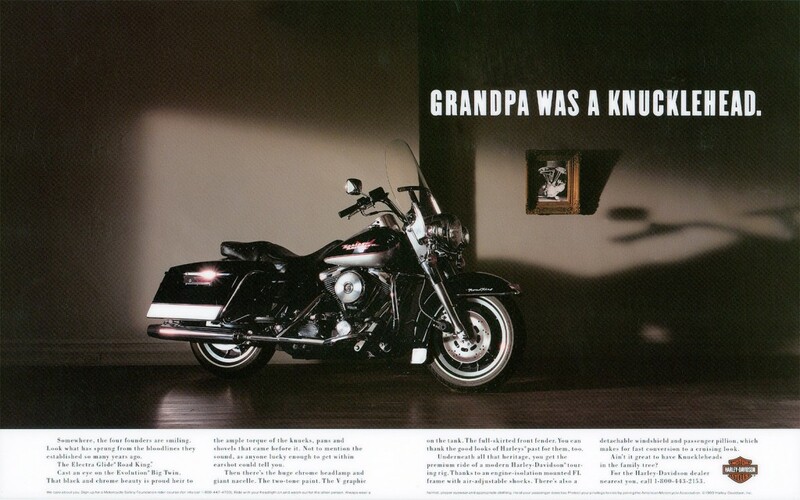 They wanted to put the motorcycles in sets to work with the very simple, yet evocative headlines. A garage, a church, a bedroom. Sounds just like what I liked to do. We talked for about 15 minutes. I felt compelled to tell him, reluctantly, that although I loved motorcycles, I had never shot one. He told me it didn’t matter, they weren’t interested in seeing every nut and bolt, they wanted to tell a story with the sets and with the light. That is why he called, that was why he wanted me to do it, that was why they were not triple bidding the job. Just me. Are you kidding!! It was a time when you could never work out of your “known” area, and every job was triple bid, numbers scrutinized to the penny. A dream come true. The bid went in, the job awarded. We started pre-production. A ferry ride to Staten Island Harley-Davidson to measure the bikes, take a close look. That dealership was old-school. A bit run down, a bit dirty in the corners, an open door policy to the shop. In a word it was great! It reeked of history and heritage. And oil. 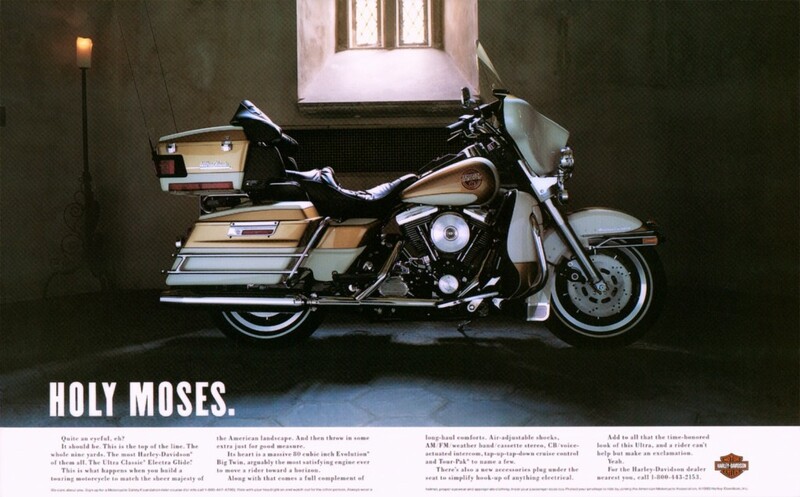 It was from back when Harleys had kick starters, and since the Wall Street phonies couldn’t start ’em, they didn’t buy ’em. Measurements taken, back to the studio, 236 W. 21 Street, and the unfortunate news that the bikes wouldn’t fit in the freight elevator. There were very few rental studios back then and our budget wouldn’t allow us to go to Silvercup Studios, so it was a dilemma. We explored taking off the front end. No. Putting them on top of the elevator. No. Asking landlord to give us 1 month lease on the vacant storefront in the building. Yes. So we moved downstairs for a month, cleaned it up (enough), and once the bikes arrived, hired a nightwatchman, as there was no alarm. There were 7 new Harleys. Seven. Everybody couldn’t keep there hands off them. Everyone sat on them and got dreamy looks. Vroom, vroom. 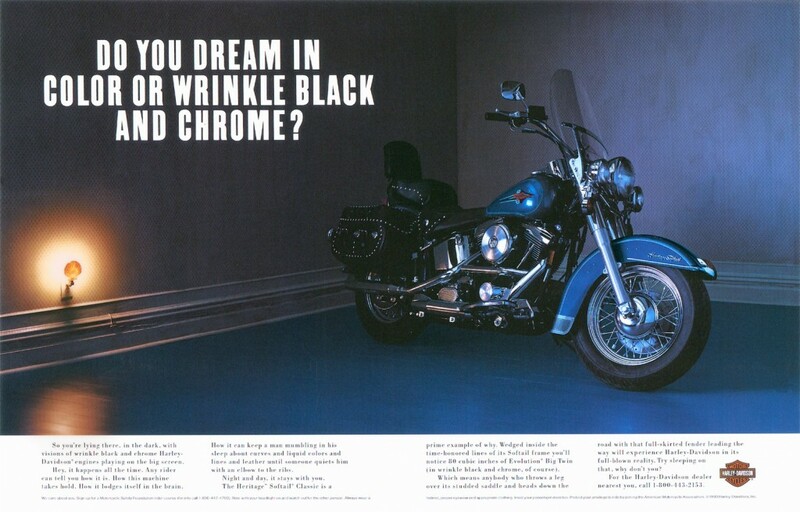 Even a Fat Boy, made famous by Arnold in “Terminator”. Now that was one cool bike. Jim arrived for the pre-light day and after talking on the phone so many times, he was just who I expected. Soft-spoken, smart, collaborative, and completely comfortable. Jim was in his late 30’s with two little girls. He bicycled to work everyday in Minneapolis, which was very green back before green was discovered. A lovely guy. The shoot went just about flawlessly. Except for no air-conditioning and a New York City July. We had a great shoot, did lots of funny group shots with the bikes. They are in a box somewhere labeled “group shots”, but I have no idea where. Before leaving for home he asked if I would do the last ad in the campaign, a running bike shot. Again, Jim surprised me because a running bike shot is another skill set all together. We shot it at the abandoned, sort of, Floyd Bennett Airfield in Brooklyn. It was late September by then. Everyone was happy. Jim, the very nice Harley client-lady, and me. I was thrilled. I had a great time on this campaign. I hated it when it was over, bikes gone, make-shift studio gone, Jim gone. Around Thanksgiving I called cause I hadn’t seen any of the ad proofs. When he answered I teased him about being too busy to send me proofs. He told me that soon after getting back to Minneapolis, he passed out at a stop sign biking to work. It turned out to be inoperable brain cancer. I was stunned and speechless, he was quite upbeat and talked about getting through this. Jim died around Christmas. I couldn’t stop thinking about his wife and girls. I felt I had never adequately told him how much his trust in me meant. How much I liked him, not just working with him. How much I would miss him even though we had known each other only 6 months. That year the Harley campaign was an ADDY finalist, up against an American Standard campaign I had also shot for Carmichael-Lynch. 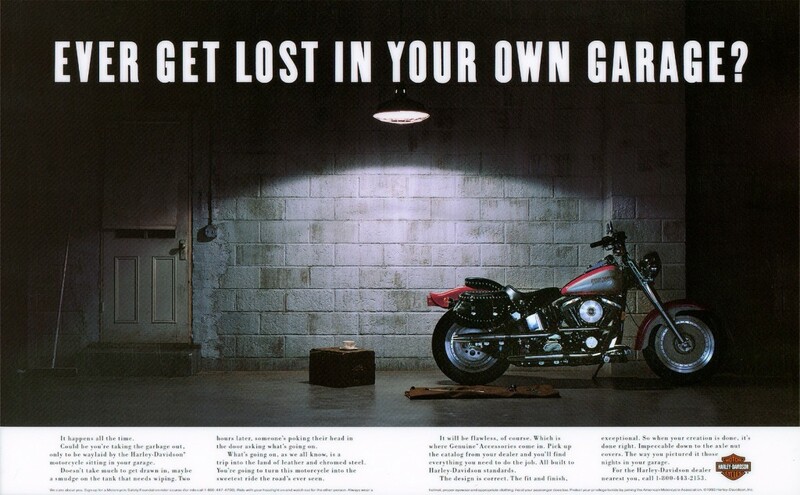 Jim and the Harley campaign won. Vroom, vroom. This entry was posted on Sunday, May 20th, 2012 at 9:35 PM	and posted in Uncategorized. You can follow any responses to this entry through the RSS 2.0 feed.